And here is the biggie—closets can make the room look smaller. As someone who has lived her adult life—both with and without children underfoot—in a historic house, I understand the dilemma. When I design new homes or large additions, we seem to add spaces large enough to serve as a small bedroom in days past, and not just for the master bedroom. Everyone seems to need a large walk in closet (along with an en suite bath—but I’ll save that rant for another day) for every bedroom. 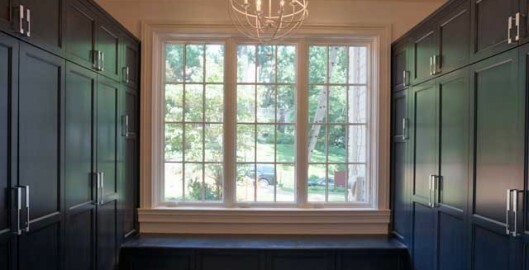 The front foyer gets a large coat closet “for guests,” and the mudroom is outfitted with lockers, cubbies and hooks as well as hanging space for family use. With new construction you can create lots of closet space. Awesome. However, frequently there isn’t the space in a renovation of an historic or older home to put these vast closets and cubbies. Or, in adding said closet, it creates the predictable and dreaded “compromise of an older home,” where something must be lost – charm, character, space — to gain a modern amenity. This is what I do: I think outside the sheetrock© box. Literally. My first choice is built-ins. They will make the room seem larger and can be designed to work with the existing home. They can be of the same style as the house, or can be delightfully modern. The wonderful thing is that they are a custom solution that perfectly fits the space and your needs. When doors and drawers are closed, they hide the mess. 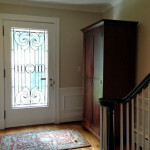 The next best option to me is an armoire, a large, closet-sized piece of furniture. 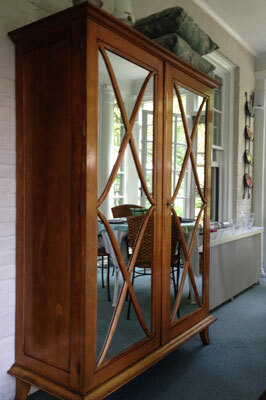 I suppose in parts of the United States they are called “wardrobes,” but I was born of European parents and in my childhood and, more importantly, in my grandmother’s home, they were “armoires.” I own three. One from my grandmother’s Parisian apartment , one I had designed and made just for me out of dark cherry from a fabulous furniture mill in rural Virginia, and one from Ikea. 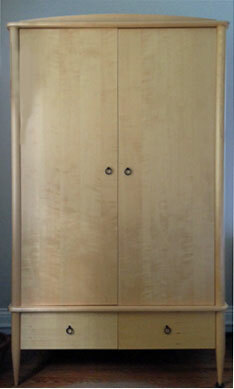 Armoires do the job without boxing in the room, and, when properly selected and placed, can be just perfect. Sure they’re not huge, but they graciously get the job done. My third option is only for those who are really willing to live “outside the box” and those who are not super messy. For these brave few, consider areas of open storage cleverly hidden behind curtains or on beautiful display rolling racks that can also be used to divide room spaces or lofts, much like open shelving. I think of my son’s 600 square foot Hong Kong apartment where every inch of space is multipurpose by necessity and buying furniture is not easy when it needs to get to the 27th floor. Enjoy browsing. There truly are options for everyone, from the traditional walk-in to the modern and loft-like. Oh, don’t forget the other rule of thumb when confronted with not enough storage—keep less! Reduce, reuse, recycle. Give away those things that you do not love or have grown past. Be ruthless with de-cluttering. It works!